What if you never had a bad hair day again? What if you could be ready to out at any given time? What if on vacation after a long day of sightseeing, you are ready for a night out on the town? That’s the freedom wig wearing provides you. Looking fabulous at any given time. There are many reasons one would purchase a hair piece. Fun, fashion, convenience, and of course hair loss due to medical conditions. Since we started our business, we have provided many with the confidence, security and freedom everyone desires when it comes to their hair; hair rules! When our hair looks great, we feel great! Did you ever notice how people love to look and compliment other’s hairdo’s. It’s the first thing people notice about us; our hair! Personally, I take this journey with each and every client. In addition to the initial process, our relationship will continue whether it be for further instructionals, sizing adjustments, maintenance or very often to bring in a friend in need, and introduce them to their experience and satisfaction at Wigful Thinking. You are cordially invited to Wigful Thinking and share the experience. 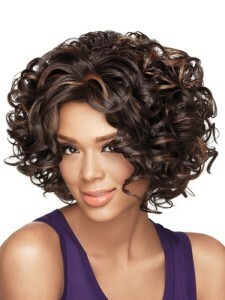 We offer an assortment of wigs in the latest styles. Our assortment of wigs includes the finest brands in wig design. Visit our wig studio for a free consultation. Often asked is the difference between a human hair wig vs a synthetic wig. More care is required with human wigs; truly like your natural hair. Synthetic pieces have a built-in memory that keeps the style without using curling irons and/or rollers. However, more HD (heat defiant) synthetic pieces are evolving; this requires additional training. If your piece has this feature, you can add curl your piece with a low-temp (270-280*F) curling tool. This process is different than curling your natural hair. Once curled, you must pin allowing each curl to curl before releasing. As always, you will receive instructions on how to perform this processes. Our Wigful Thinking compassionate expertise can help you choose the perfect styles and colors for you.